During the early 1920s Picasso's production alternates between Cubism and a Classical style. Side by side with Cubist still lifes of the utmost structural refinement we find figural paintings in his Classical style, mostly with subjects drawn from mythology. A large number of drawings - usually pen drawings - also date from those years. In addition there are pictures of dancers and harlequins, often quite realistic, which testify to Picasso's continuing interest in the world of the ballet and the stage (which was especially kindled by his commissions for the Ballets Russes). Picasso had reached the age of forty and was now in full possession of his creative powers; the most varied impulses of his artistic will found their outlet in different styles. In addition to these works, a new kind of picture begins to appear in these same years, and Picasso discloses yet another aspect of his complex personality: the portraits and sketches of his young son Paul. With them we discover a new facet of the artist's many-sided genius. These works lay no claim to raise or to solve new artistic problems: they belong wholly to the artist's personal life, and he kept nearly all of them. Precisely because these works were not intended to solve any formal problems but were produced casually, almost playfully, they disclose the full breadth of Picasso's technical mastery. It is precisely in the works where his eyes and hands are freest that the richness of his creative ideas is most clearly and fully disclosed. 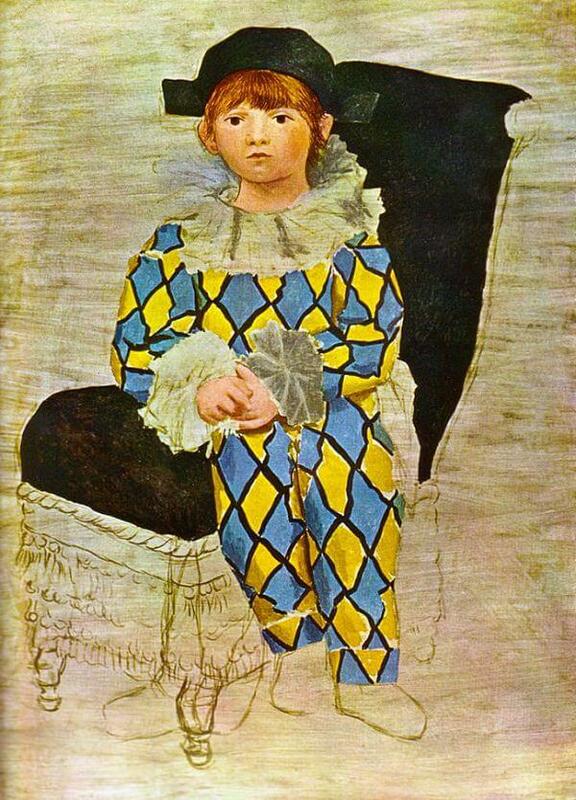 In the various portraits of Paul - in Pierrot costume, dressed up as bullfighter, or simply a child playing - Picasso shows his facility in handling composition, color, and the arrangement of space. As much at his ease as if he were making an entry in his diary, he places the figure and establishes its space on the picture surface, he animates the sparse harmony with some lively accent and articulates the large color areas with a few rapid lines or brushstrokes. Looking at a portrait such as this, no one would suspect how much of Picasso's experiments with pasted papers, how much Cubist discipline has gone into these casually tossed-off little works. And yet it is these features that account for the portrait's sure mastery and raise it high above most artists' realistic portraits. Picasso's affection for his little boy is merely the painting's starting point; what makes it a masterpiece is Picasso's creative sureness.